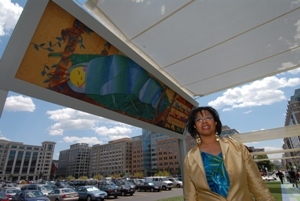 In June 2006 two illustrations I created for children’s book were transformed into large scale public art works in Washington DC. One, awarded by the D.C. Commission on the Arts and Humanities was a 7′ by 27′ reproduction of an illustration I created for the book Crawl, Caterpillar, Crawl. It stood for over a year as part of the commission’s Art Walk exhibit and hung on the site of the former convention center. 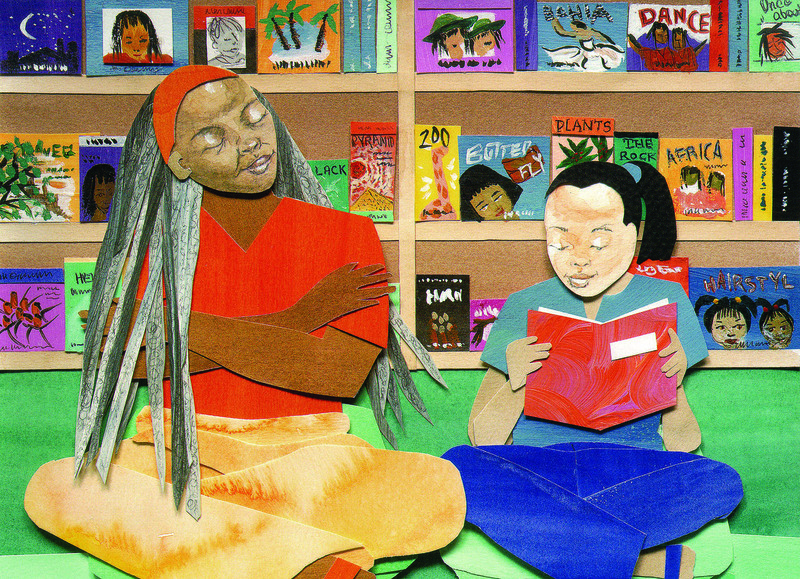 Adjoa Burrowes 5′ x 15′ painted mural at the Martin Luther King Memorial Library, Washington D.C.
” The Gift of Words” a 5′ by 15′ painted mural was based on the book Destiny’s Gift by Natasha Tarpley and is permanently installed on the second floor of the Martin Luther King Jr. Memorial library in the Children’s Book Division. Illustration “Words Are A Powerful Gift” from Destiny’s Gift. This artwork was the inspiration for the library mural.